When is the story of a piece of artwork helpful, and when is it best to allow the viewer to create the story? This is a constant tension that I experience when I create and write about my work. Many of my images are inspired by actual places I have visited, or places that inspire me. People often see different things, which argues for the universality and diversity of our human experience, and this is delightful. Elizabeth Busey. March of the Cumulus, Reduction linocut on Rives BFK. 13 x 28in, ed of 28. It is a holy drive of sorts. Windows up – it is only with my eyes that I am able to take in the grandeur of creation. Vast undulating planes of vibrant greens and shocking chartreuse unfold before me like an origami spring let loose. The fields are new wheat, milo, or rapeseed. Over a small ridge, and suddenly the Tournesols – the sunflowers – slowly point the way to the source of all energy. At 80 miles per hour, I feel slow and meditative. Cruise control on, my feet relaxed, the car steers itself ahead with little input from me. At once a jewel comes into view – a small lake with the dead white carcasses of trees sticking out topped deliciously with black crows. What color blue is this? I am going by so fast that I cannot guess – but it is a hue I carry inside me. The July sky is cloudless. The sheer vastness and weight of our cerulean atmosphere presses down on everything. We are slicing through a kaleidoscope carpet of colors held fast by this immense sky above as my prayers begin. A prayer for the farmers and their difficult life. Being a farmer means risking your livelihood against capricious storms and winds and pestilence – against banks and markets and tariffs. A prayer for the land. Little I see is in fact nature-made. The fields are planted atop soils that used to host prairies. A prayer for the creatures that used to live in these prairies. Those that roamed along or crawled beneath or soared above. Now it is just the crows that call this place home. A prayer for those whose footsteps and hoof prints used to make tracks in this land. For the sadness of their loss and the hope that their spirits might connect in new ways with forgiveness. One hand on the steering wheel – my prayers emanating from this tiny capsule — carried off by the wind. 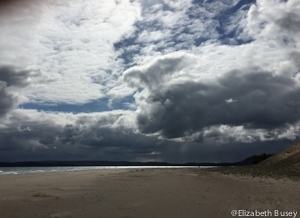 This entry was posted in Inspiration, Landscape and tagged artwork, inspiration, March of the Cumulus, North Dakota on May 23, 2018 by Elizabeth Busey. Life is not linear…and neither are the ways of inspiration. It all started with a landscape-themed invitational show at the Krempp Gallery in Jasper, Indiana. The curator of the St. Meinrad Archabbey in Ferdinand, Indiana saw my work there, and contacted me to see if I would like to have a show in their library next January. Can you tell whether this topography was created by nature, or by people? What does John Mellencamp have to do with land? I should explain that John Mellencamp lives outside of Bloomington, Indiana and owns land adjacent to my subdivsion, which he bought in the 1970s to prevent the subdivision from getting any bigger. He was in his mid-twenties at that time, and was protecting what was then land recovering from farming from becoming more split levels and ranches. There are now hiking trails through this land, and I appreciate his forethought. Recently Mellencamp was on the IU campus to introduce a screening of the documentary From the Ashes, which looks at the US coal industry, and how it affects disparate areas of the nation as well as the environment as a whole. I wasn’t able to attend the screening, but discovered I could easily purchase the documentary on Amazon. (You can rent it as well on many streaming services.) It is worth your time to watch this documentary. Coal is land. Burning coal is the biggest contributor to climate change. Leaving coal in the ground — admitting that clean coal is economically not feasible — stopping mountaintop removal — protecting water sources from pollution … all of these topics center on land. How we think about it. How we share it and profit from it. I’ve started two small studies of topography, thinking about land not only as a surface, but also imagining what is underneath. How can I talk about this three dimensional question in a two-dimensional medium? This new direction may be meandering and uncertain. But it feels important to take the journey. 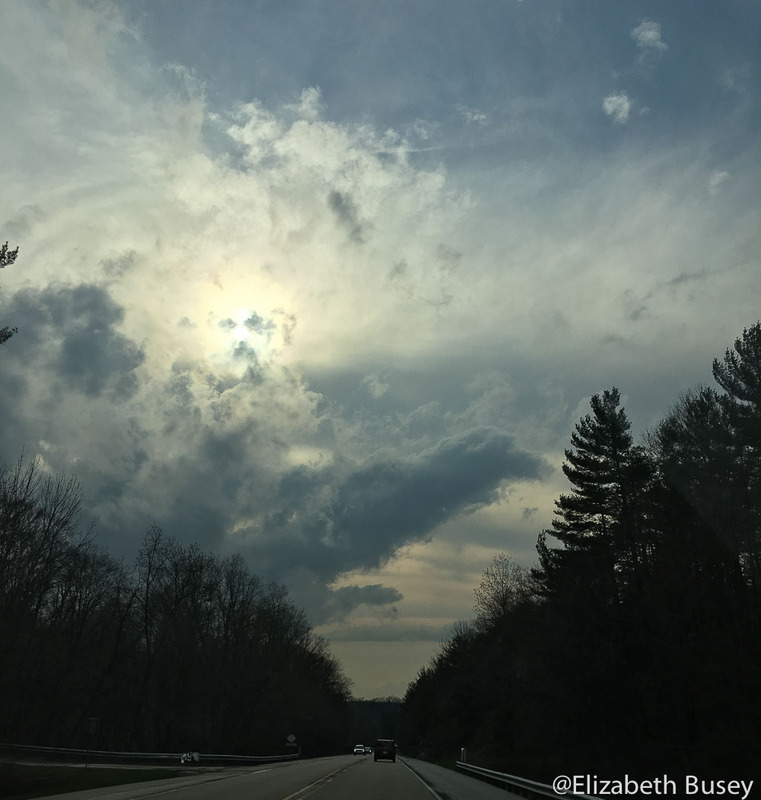 This entry was posted in Inspiration and tagged From the Ashes, global warming, inspiration, land on February 16, 2018 by Elizabeth Busey. 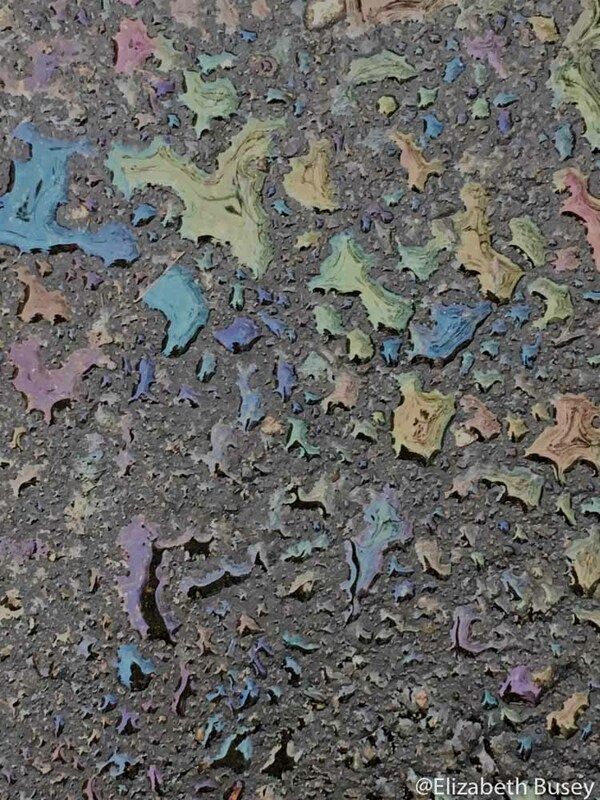 Oil on pavement on a misty day. How do you find beauty in your own backyard? This was a question posed to me by my dear childhood friend Renee’s husband, Henry Styron, as part of an interview for his blog. The blog — Advice for Everyone (and other stuff) is a delightful combination of interviews with regular folk like me, and other things Henry has compiled from the more famous — from William Shakespeare to Ann Landers. Follow this link to my interview and my advice! 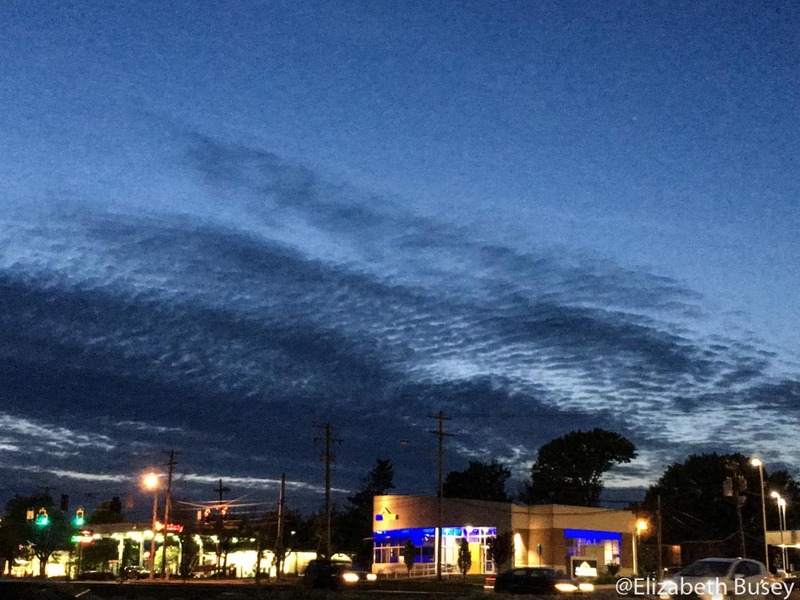 Fingerprint cloudscape from Bloomingfood’s parking lot! This entry was posted in Inspiration and tagged Advice for Everyone, beauty, inspiration on December 8, 2017 by Elizabeth Busey. Finding your next great idea — or maybe you would call it connecting with your muse — can be difficult. I wonder if Georgie O’Keefe had self-doubts about her transition from dark cityscapes to colorful desert landscapes. 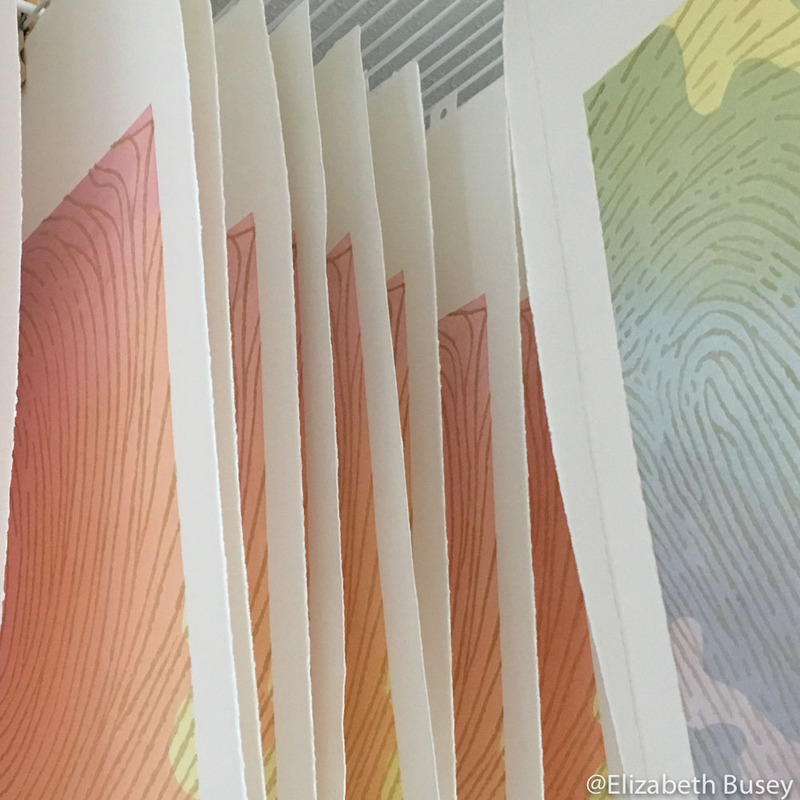 I’m still mulling over what to do with my recent eclipse study, but have been recently captivated by the topographic map bookmarks we made at my recent Open Studio. 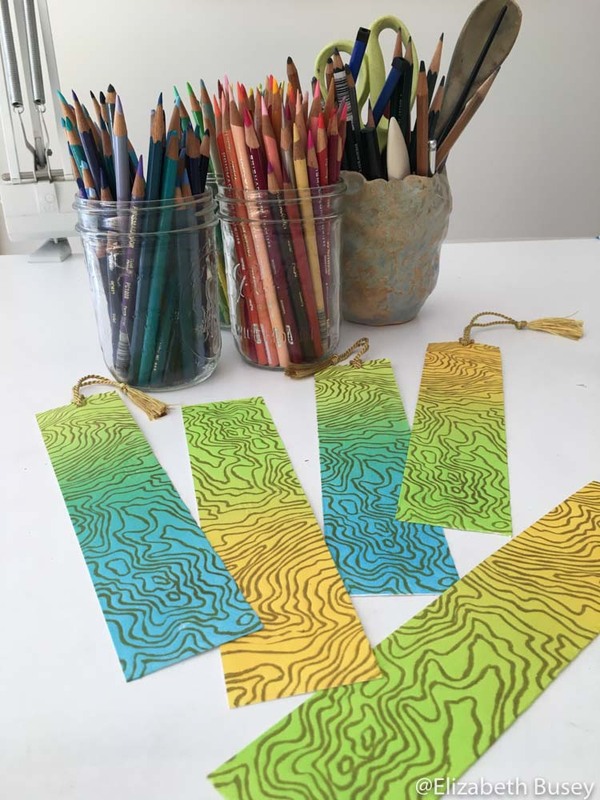 These bookmarks continue to inspire me with their undulating line work. I created the drawing for the second block from a real topo map of the Red River Gorge in Kentucky. I have hiked this area which is part of the Daniel Boone National Forest. It is filled with unexpected formations, from gorges to natural bridges, all noted by these squiggling lines. Back in my studio, most of my work does not depend on line work specifically, but I continue to be drawn to these topo lines. 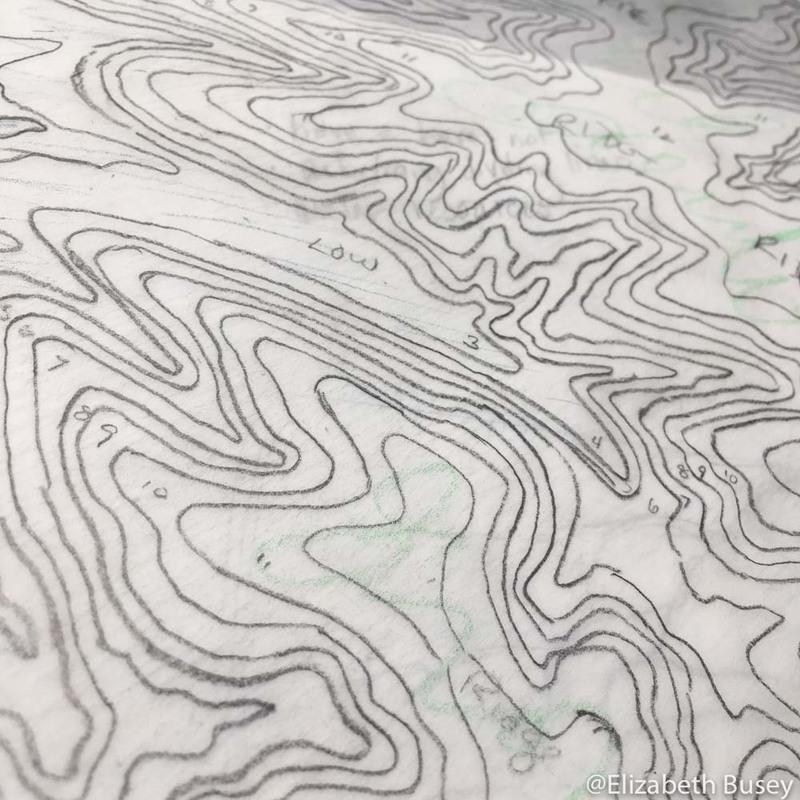 Topographical maps are not only essential when hiking, but aesthetically inspiring as well. 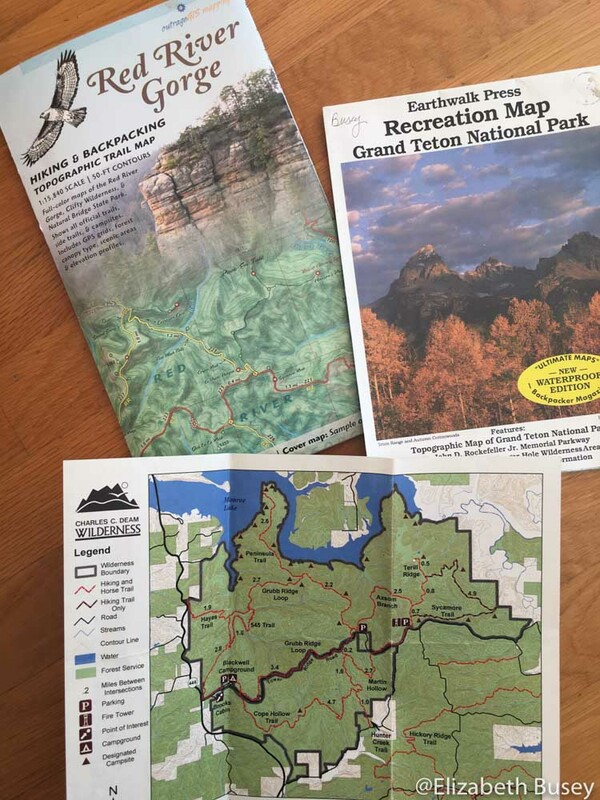 We have a collection of hiking maps from our travels in North America and Europe. In our recent trip to the Pyrenees, my husband and I relied heavily on a topo map to get us safely down from an exposed trail during an afternoon thunderstorm. The lines told us that yes, the scree-filled avalanche chute was in fact the way down. 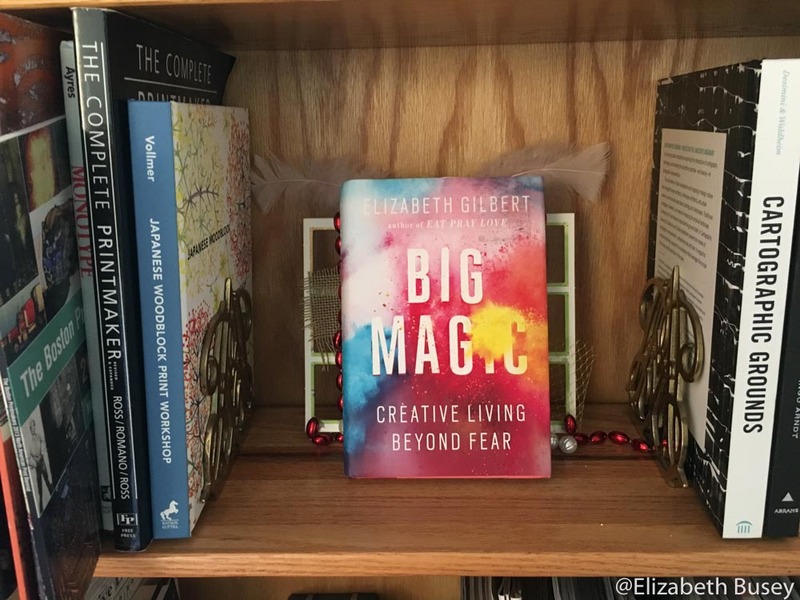 Elizabeth Gilbert’s Big Magic is essential reading if you are a creative person who sometimes puts too much pressure on your creativity. If you are a creative person of any type, you should get a copy of Big Magic and read it. I refer to mine so frequently that I don’t loan it out to anyone. In the book, Elizabeth Gilbert, author of several books including Eat, Pray, Love, discusses how to live sanely as a creative person. One of my favorite parts considers how we mistreat our creativity in our quest for fame or remuneration. I am guilty at being unkind to my creativity when I demand to know before I start whether my next endeavor will be worthy of a frame — or a possible entry for a prominent show — or my next sale. When I yell, so to speak, nothing goes well. This entry was posted in Artistic Growth, Inspiration and tagged Big Magic, creativity, Elizabeth Gilbert, inspiration, maps, topography on November 4, 2017 by Elizabeth Busey. I had a conversation recently with a friend who is a professional musician. She mentioned that she doesn’t listen to music at home. “It feels too much like work,” she admitted. She usually opts for television or non-music radio. This observation resonated with me. There are times in my life where I need some sort of creative distraction to relax and alleviate stress. 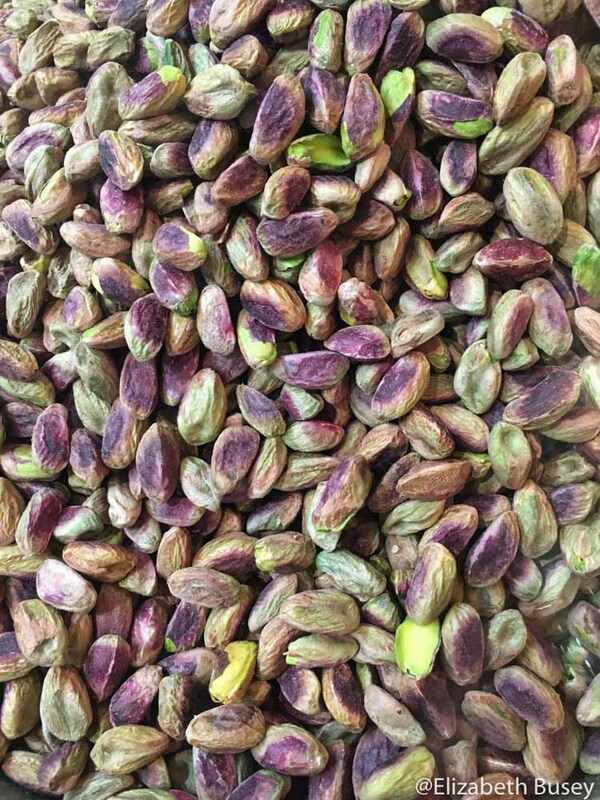 Because my visual art practice is what I do for a good part of my day – and is sometimes the source of my stress — I have been looking for other ways to be creative. I am thoroughly enjoying reading poets who write about the natural world, and trying my hand at some writing as well. I recently signed up for a writing circle with a local nonprofit writing group called Women Writing for a Change. The topic of the six-week Thursday night writing circle is “Listening to Mystery: Writing, Presence and Poetry.” Each week, we begin with a poetry reading from various spiritual traditions and have a time of meditation. We do “fast writes” where we write furiously about whatever comes to mind. Sometimes we share our writing in small groups, and sometimes we read to the entire circle. I am thoroughly enjoying the experience, in part because it is a creative practice that I am doing just for me. For two and a half hours my cell phone is silenced, and I am present to myself and my circle-mates. I have no ambitions to become a published writer. Creation for creation’s sake is a gift. This class has also encouraged me to have a morning ritual to get myself into creative time. For years I have fought against the Morning Pages of Julia Cameron. Thanks to my writing circle, I have been beginning my creative time by emptying my monkeymind on the page and writing any thoughts about what I want to accomplish in the studio that day. Then I read a poem (my favorites are Mary Oliver and W.S. Merwin) and spend some time writing about something I hear in the poem, or something the muse brings me. After that, I am in a place to begin my studio time. 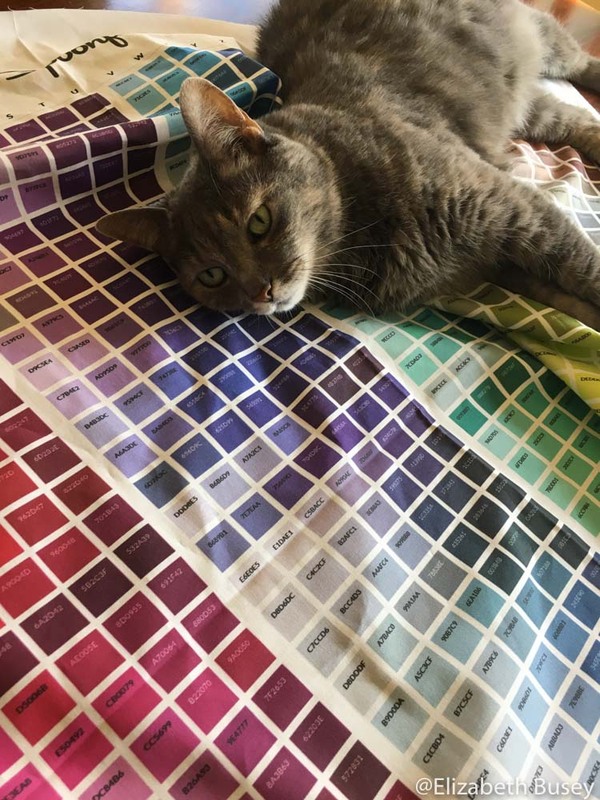 My cat Gingersnap relaxes on a color chart from custom fabric printer Spoonflower. Apparently she has a fondness for purple. I have also begun dabbling in designing fabrics using some of my patterns that I have simplified. I have no idea where this practice will take me, but I will at least reupholster my sagging dining room chairs and get some new pillows. I find that with these new additions to my creative life, I am finding my studio time to be more energized and fruitful. What do YOU do to enhance your creative practices? 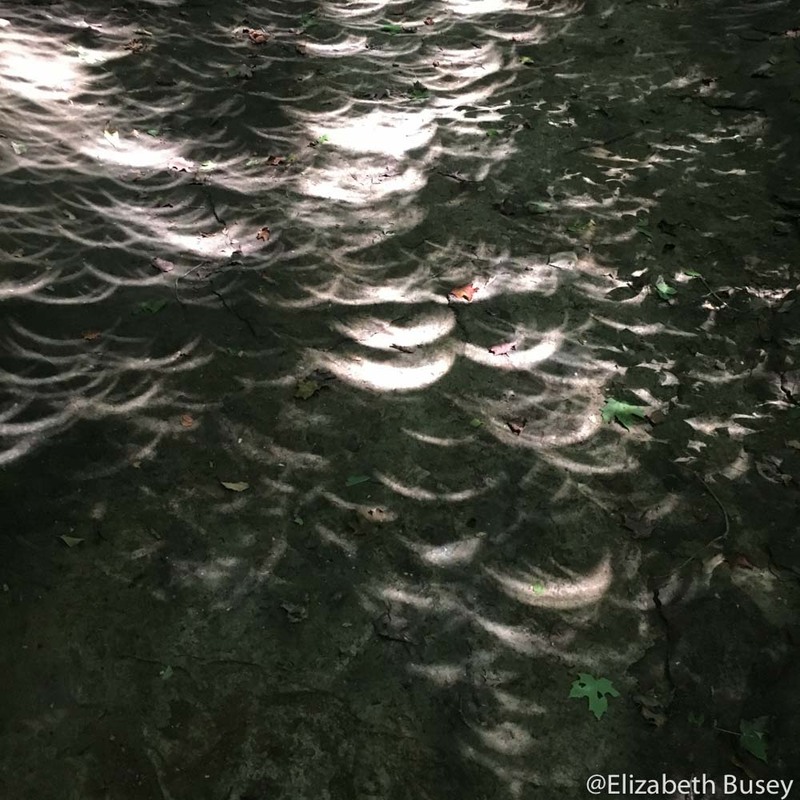 This entry was posted in Art as Connection, Inspiration and tagged fabrics, inspiration, poetry, Women Writing for (a) Change, writing on October 9, 2017 by Elizabeth Busey. When I can’t create, I look for unexpected images with my Iphone. This one is the supporting bar of one of the rollers in my studio. Netflix’s new eight part series Abstract is an absolute delight. 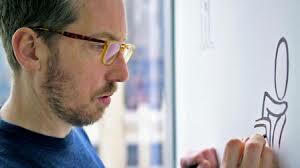 Each 45-minute episode profiles a different design professional. We learn where their ideas come from, how they began, and most importantly how they go about creating. I used to have favorite episodes, but after seeing all of them, I would recommend watching them straight through. I find watching people create a calming yet stimulating experience, as well as a hopeful interlude while you wait to get back to your own creating. Illustrator Christoph Niemann is the genius behind many notable New Yorker magazine covers. Craft in America is a PBS series created in conjunction with the Craft in America Center. While most episodes focus on three -dimensional or low-relief two dimensional work, they do include printmaker Tom Killion in an episode on process. On the Craft in America site, you can search by episode theme, location and even medium. I could lose myself in this site for days. 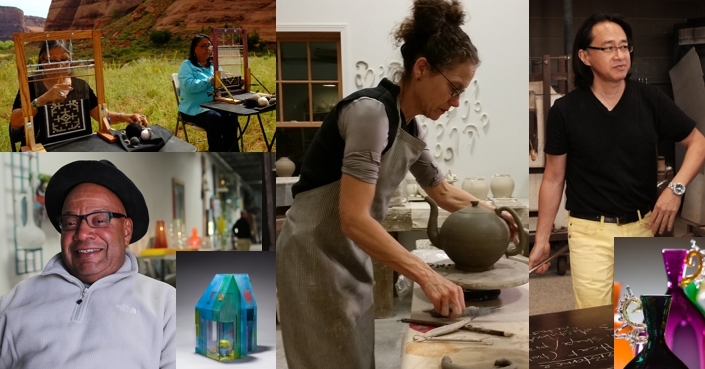 Craft in America artists are fascinating to watch, and tell inspiring stories. So whether you are cooped up by circumstance or weather or health, there is always something you can watch to stay inspired. This entry was posted in Inspiration, Uncategorized and tagged Abstract, Craft in America, inspiration, Netflix on June 15, 2017 by Elizabeth Busey. Inspiration is a quixotic thing. Sometimes an image’s meaning is obvious, but for me, the stories behind my linocuts make their presence known in the slow, methodical process of creating. Such was the case with the linoleum block I created for my recent experiments with silk. 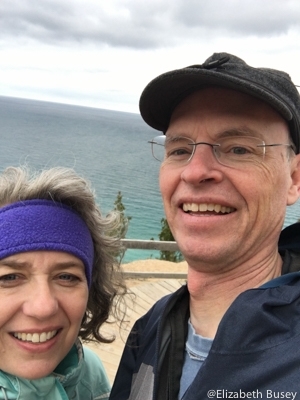 My musings inspired the following essay, a version of which will be published in a compendium about justice sponsored by First United Church, Bloomington, Indiana. It is the brainchild of my dear friend, writer and artist Donovan Walling. My personal favorite in the Cope Hollow series. I am fortunate to live and make my art in a naturally beautiful place. Hikes in the hills and hollows around Bloomington, Indiana often inspire my art. 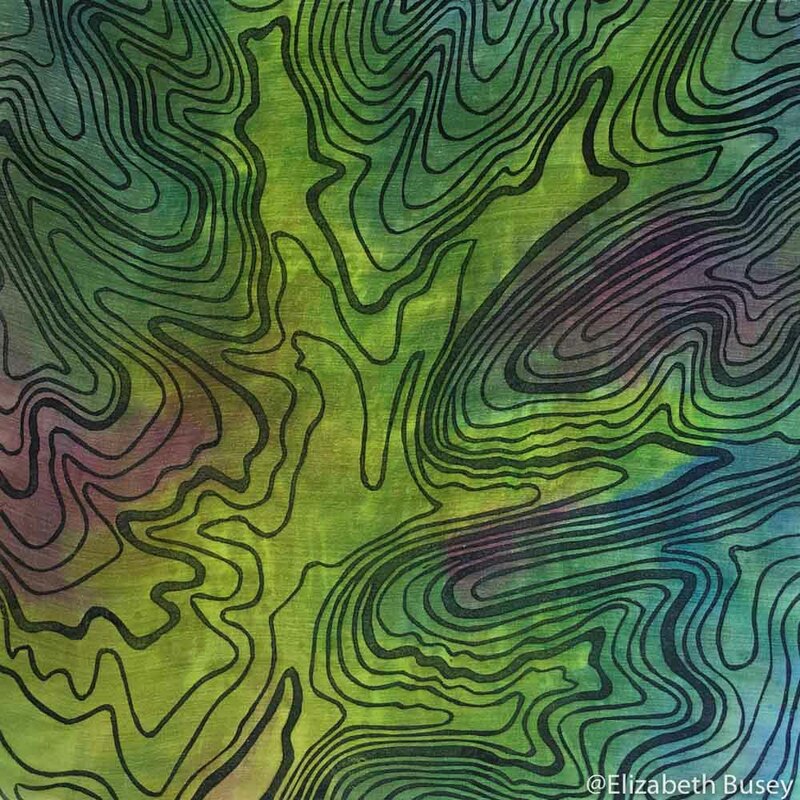 I recently completed a series where I needed a striking image of topographical lines. An area on a map of the Charles Deam Wilderness caught my eye. 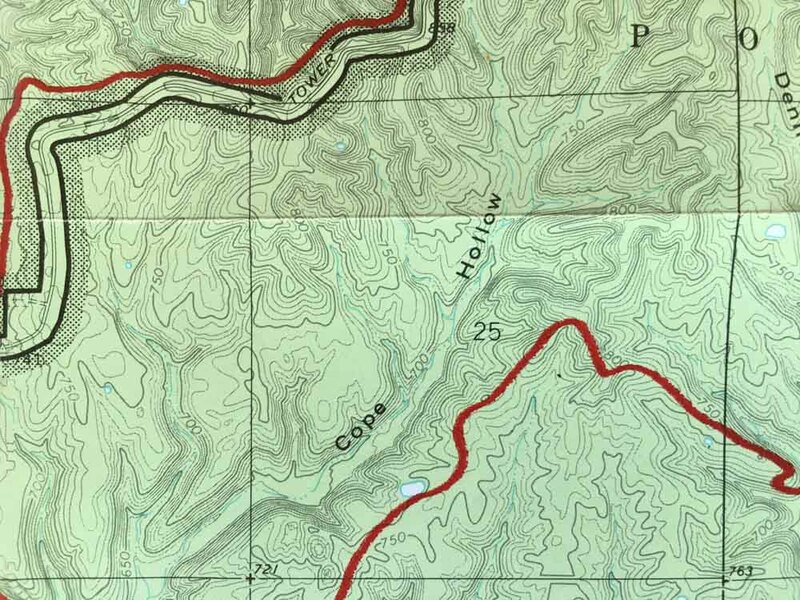 Poetically called Cope Hollow, it had fingered bottom lands with steep hill contours radiating out like ripples from a raindrop. When I title my pieces, I strive for playful ambiguity. I want people to see their own experiences in the work. In this case, the actual place demanded acknowledgement. Ridges and hollows in this part of the world are named for early residents. Certain names are still quite common in the county, but no listings for Cope appear in the phone book. Two unpublished articles from the public library provided the best information about the Deam Wilderness, which was officially designated as a wilderness area in 1982. This area was the last part of Monroe County to be settled beginning in 1823. Native Americans may have hunted here at a much earlier time, but they did not stay. Almost all of the Deam Wilderness is part of the Norman Uplands, a formation of mostly siltstone that was sculpted by glacial run-off into drainages and steeply-sloped ridges. 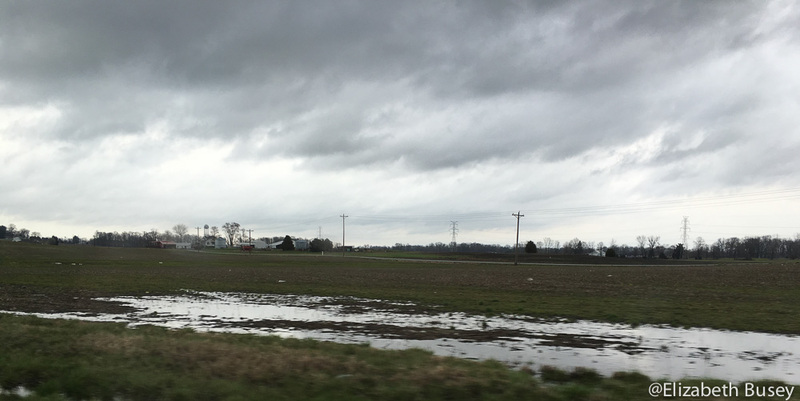 The desirable bottom lands were the first to be settled, but were subject to unpredictable spring flooding. The ridges were settled last, some so narrow they only had room for a house and a frog pond for water. Top soil here is extremely thin and the slopes were too steep to be settled. Making a living meant trying to raise enough crops and livestock to feed your family, and most families relied on logging for cash income. Who would choose to live in such a place? Certainly those who had enough means would have kept right on going, reaching lands farther west that were much more suitable for a profitable economic life. Those who remained spent day after back breaking day felling trees and digging stumps, trying to coax crops and fodder from thin steep soils with inconsistent water. When the Forest Service began buying land for a national forest in 1935, it is no wonder many people jumped at the chance to sell out. In my daily life, I am surrounded by people who are socioeconomically similar to me. Many are artists and friends. Some collect my work. A few generations ago, areas just around my home were the homesteads of people who clawed a subsistence living from an ungenerous land. Some lasted so that their names are still mentioned in the local paper. Others like the Cope family, have vanished. Many around the world still experience this harsh life today. A search for statistics paints a sobering picture of poverty. How did I become so fortunate? It is hard to know how to help when the global problem is so vast. Perhaps it is best to start small, in my own backyard. Cope Hollow is a good reminder. This entry was posted in Environment, Inspiration and tagged Charles Deam Wilderness, Cope Hollow, Indiana, inspiration, Linocut, poverty on October 6, 2016 by Elizabeth Busey. I am in the throws of building enormous frames for my latest large linocuts Breath of Hermes and Summertide Brings the Derecho. I’m also planning for two new linocuts and they are in the messy stages as I try to push my linocuts to incorporate new techniques. 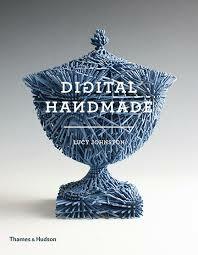 My planning has been enriched by the discovery of Digital Handmade: Craftsmanship and the New Industrial Revolution by Lucy Johnston (2015). This beautifully photographed book highlights artists and designers who are using digital processes to push traditional media in new and challenging ways. Johnston, Lucy. (2015) Digital Handmade:Craftsmanship in the New Industrial Revolution. New York: Thames & Hudson. This entry was posted in Artistic Growth, Inspiration and tagged artists, designers, Digital Handmade, innovation, inspiration, Lucy Johnston, technology on August 26, 2016 by Elizabeth Busey. I am suddenly longing to get back to carving and printing — as I have been consumed with gathering new imagery, and getting the work I have completed ready for new homes. The wind was blowing so hard — sometimes taking sand with it — that all I could do was point my Iphone in the direction of the clouds and push the volume buttons. We did take a moment to snap a quick self-portrait. Note the fleece headband — in May! Back from our weekend, I have been madly framing and preparing to take my work to the Broad Ripple Art Fair at the Indianapolis Art Center. 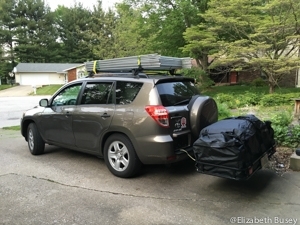 One of the greatest challenges — undertaken by my dear husband — was to create a way to transport all of my work and equipment in our RAV4. Here is his solution, complete with clips that hold the metal display panels together that he 3-D printed himself. Quite a mensch! 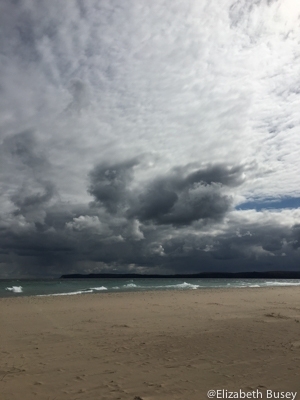 This entry was posted in Art Festivals, Inspiration and tagged art festivals, Broad Ripple Art Fair, clouds, inspiration, sleeping bear dunes on May 20, 2016 by Elizabeth Busey. You never know when you will see really special formations. This one looks like part of a Kelvin-Hemlholtz formation. This menacing beauty emerged after I drove through a complete white-out of rain. My husband took the image as I tried to regain my composure. I felt sure we were going to be engulfed. In a landscape with very little elevation, clouds provide another dimension. I can’t really see the clouds reflected in the flooded fields from this angle, but that is what imagination is for. When the sun and clouds compete for attention, you can get some spectacular effects. 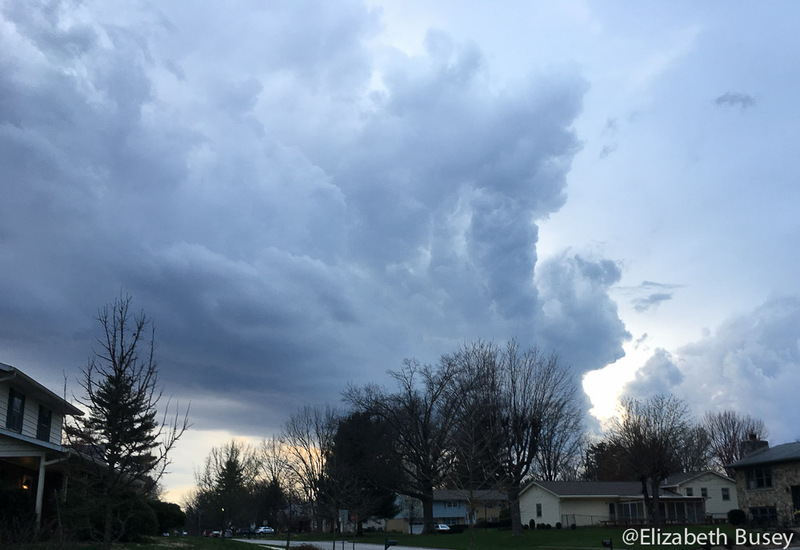 This cloud followed us around on our Easter night walk in our neighborhood, and brought super-ball sized hail. I hope my flight to Portland comes complete with some spectacular clouds as well, but perhaps since I want a smooth flight with no delays, that might be asking too much. If you want to see images from the 2016 Southern Graphics Council International conference in Portland, Oregon you can follow me on Instagram at elizabethbusey. Or search for #sgci2016 for images from lots of printmakers. 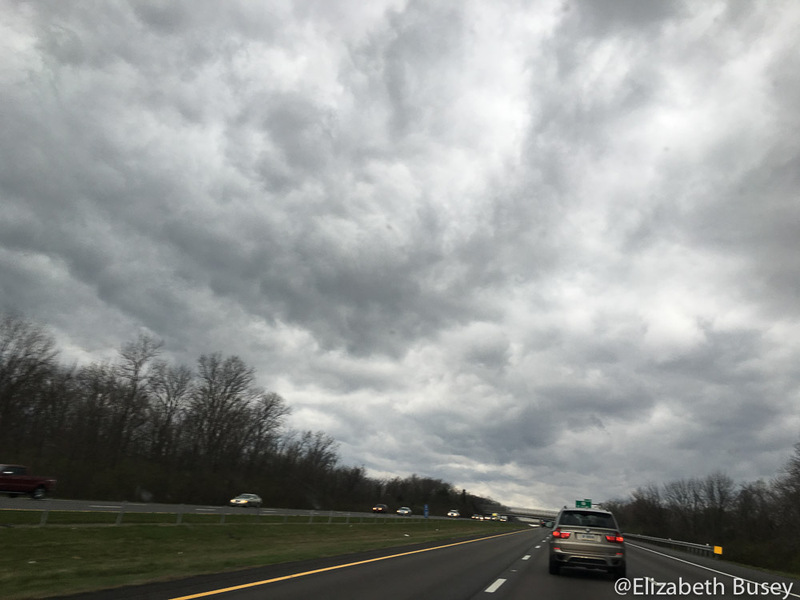 This entry was posted in Environment, Inspiration, Landscape and tagged camera, clouds, inspiration, Iphone, scgi, scgi2016 on March 29, 2016 by Elizabeth Busey.